Bicycle tread patterns serve one of two purposes. Knobby treads on off-road tires provide better bite on loose surfaces such as dirt, sand, and gravel. Grooved treads on road tires push some of the water on the road to the side, reducing the amount of water that is sprayed up behind the wheel. Bicycle tires are not susceptible to hydroplaning (at realistic speeds) because of their crowned profile and narrow width, so tread does not need to prevent hydroplaning. For dry weather road riding, tread pattern is a non-issue. Most high-performance road tires have smooth or close to smooth treads, as these roll fastest on dry roads. For wet weather riding, we recommend a slightly wider tire (for a larger contact patch), with some grooving in the tread. The Continental Grand Prix 4-Season with Vectran is one of our favorites for winter commuting on our road bikes. For racing in wet weather, tread pattern isn't as important as grip and light weight. Look for a grippy rubber compound like that found in the Vittoria Corsa Speed G+ Clincher. For touring, we suggest a wider tire with a moderate amount of tread grooving. 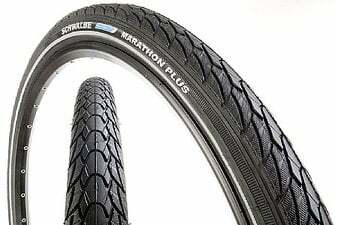 We like the Grand Prix 4-Season in 28mm, or the Schwalbe Marathon Plus 700c Tire (HS 440). If your tour will take you on gravel or hardpack, consider a bit of extra tread to keep you rolling confidently. The Marathon is famous for good reason, or for more bite, we like the Clement X'Plor MSO 120 TPI Adventure Tire. Mountain bikes can make great pavement riders with a different tire tread, too. Check out our article on Mountain Bike Road Tires for suggestions. For off-road mountain biking, tread pattern is more important, and the kind of tread you should look for depends on the type of riding you want to do. If you're riding a mix of roads and hard-pack trails, look for a low-profile, semi-slick tread like that found on the Continental Contact Tire or the Kenda K847 Kross Plus 26 Inch Tire, which will roll fast on road but features knobby shoulders to inspire confidence in the corners. For all-around trail riding, you'll want larger knobs to bite into loose surfaces. A tire with shorter knobs in the center and deeper ones toward the edge will, again, keep you rolling fast on the straight stuff and keep a good grip while cornering. The WTB Nano Race 29 Inch Tire is an awesome example. 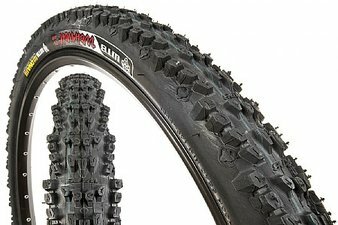 If you're riding in wet conditions, you'll want a tire like the Panaracer Rampage 29 Inch MTB Tire with large knobs for traction on slippery rocks, and a looser tread pattern so mud doesn't get stuck in the grooves. For downhill riding, air volume (to absorb hard impacts) is more important than tread, but the best treads for this style of riding are fairly aggressive for good bite in the corners. Still have unanswered questions about tire types or tread patterns? Drop us a line at 1-800-682-0570 or [email protected].